Science versus emotion in dental filling debate: who should choose what goes in your mouth? The growing debate over the safety of silver-colored fillings, known as dental amalgam, pits science against emotion, and consumers are caught in the crossfire, according to the American Dental Association (ADA). The decision about what to use to fill your cavities is a matter best decided by you and your dentist the ADA says, yet emotional reports claiming amalgam is responsible for a variety of diseases, are confusing and perhaps even alarming people to the point where they will not seek necessary dental care.If you are reading this page, chances are very good that you are among the majority of Americans who have had one or more teeth filled with an amalgam. The common name for this dental procedure is "filling." Most dental amalgams are silver in color and are made from a mixture of mercury and an alloy of silver, tin and copper. Mercury makes up about 45-50 percent of the compound. 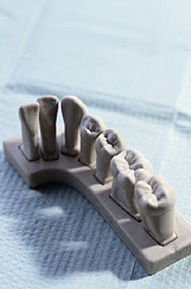 Mercury is used to bind the metals together and to provide a strong, hard durable filling. Mercury has been found to be the only element that will bind these metals together in the best possible way to manipulate the material into a tooth cavity.